V21 Use laser scanning technology to capture spaces to produce 3D Virtual Tours and Exhibitions, allowing you to explore a space as if you are there. The benefits to our clients include facilitating accessibility, audience development, marketing and archiving. V21 work across all sectors and V21 Artspace is dedicated to the Arts, Culture and Heritage Sector. Since Feb 2017 we have produced over 250 Virtual Tours which have been explored by over 200,000 virtual visitors. 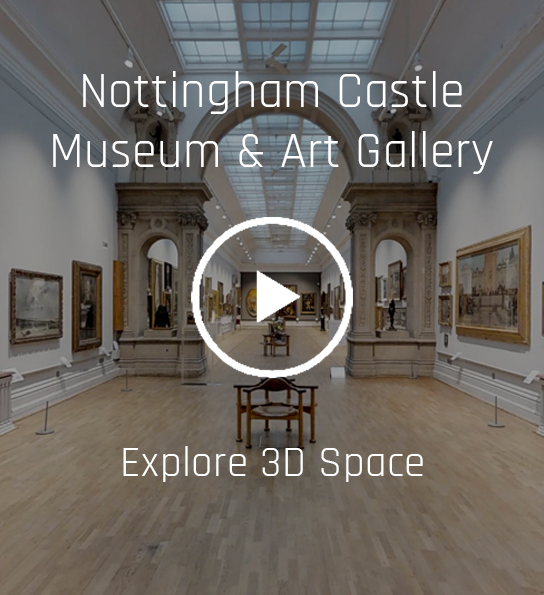 Local spaces include Nottingham Castle, Wollaton Hall, Newstead Abbey and Nottingham Contemporary. Our work has taken us across the UK, Channel Islands, into Europe and the USA. The latest service we offer is the development of CGI/VR environments for visualisation projects and art exhibitions, producing an immersive VR experience compatible with HTC Vive and if a VR headset isn’t for you we have made these experiences available online and via mobile app. Recently partnering on a project with Quad in Derby to develop a CGI/VR Gallery for Anim18, celebrating British Animation, led by Film Hub Wales, Chapter (Cardiff) BFI Film Audience Network, BFI, awarding funds from The National Lottery. Other services include professional video and photography production. Supporting charitable trusts by donating our services, most recently for Style for Soldiers: Art in the Aftermath (art, poetry and film created by former servicemen suffering from PTSD or brain injury predominantly incurred in Afghanistan). We are currently working with Derby Hospitals Charity to create a virtual patient experience for the Radiotherapy Department at the Royal Derby Hospital. This will help increase awareness for their charity appeal to raise funds for a fourth Linear Accelerator which targets and treats cancer.